Maine beekeepers enjoy socializing, snacking, perusing raffle items and sampling honey contest entries in USM’s Abromson Center lobby. The University of Southern Maine campus was all a buzz on Saturday October 16th as beekeepers from across Maine swarmed Hannaford Hall the Abromson Center for the second Maine State Beekeepers Association Annual Meeting of 2010 hosted by the York County Beekeepers Association. Last spring, the MSBA Board decided to move the annual meeting from late spring to mid-fall in the hopes that we will have less conflict with beekeepers getting ready for the new spring season, bee schools and the arrival of spring bees. Judging by the turnout and response to the excellent presentations, this will become a fall classic! Beekeepers started networking and catching up with each other as soon as the doors opened. We were able to scope out scores of raffle items and start tasting 30 or so 2010 Maine raw honey samples entered into the York County Beekeepers Honey Contest. After a welcome from MSBA President Erin MacGregor-Forbes, Provincial Apiculturist of Alberta Dr. Medhat Nasr shared his remarks on bee management and health from overseeing the inspection of around 250,000 managed hives in Alberta. Dr. Medhat Nasr explains his double-jar alcohol rinse method for quickly and easily determining Varroa infestation levels. He took us through his bee management puzzle of climate, seasonal management, location/environment, and pest management. His remarks on doing management on-time, in a year when our spring came a month early, caught my ear—circumstances allowed the varroa mite an unfortunate head-start and meant that you may have seen more of your colonies crash this fall because the mites had vectored an extra month of diseases to our colonies by the time we treated for mites in our normal early September time frame. Dr. Nasr also demonstrated his double-jar, relatively easy 70% alcohol rinse of 300 bees (one inch in the bottom of the jar) for determining the Varroa infestation. In this sample from a brood frame, more than seven mites is a problem. Dr. Julianna Rangel discusses swarming signals as observed inside hives. Dr. Julianna Rangel, a post-doctoral Associate at North Carolina State University and the program coordinator for a new queen rearing initiative in NC, gave two very interesting presentations. Her first remarks detailed how we can all raise a few queens in our own apiaries from our strong survivor colonies to use for increase and/or dead-out replacement colonies instead of importing package bees and queens from away. 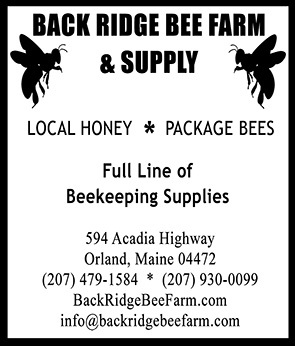 What a great way to sustain strong Maine honeybee populations. Her second presentation took us through her work with observation hives on an island off the coast of our own York County to determine how a colony initiates a swarm departure. Her video of the bees’ piping-sound “warm up,” buzz-run signal “time to go,” worker-shaking signal “get active,” and nest site scout waggle dance were fascinating. State Apiarist Tony Jadczak shares his report of Maine apiaries for 2 010. After a very tasty lunch, more great networking and honey tasting (it takes awhile to taste 30 samples!) our own State Apiarist,Tony Jadczak provided an interesting overview of what he had been seeing in colonies across the state. My notes show that he saw what many of us observed in our own beeyards: an early spring, a great spring flow, a mid-summer dearth and fall colony crashes as a result of a varroa mite with a month’s head start. This reinforced the need for successful beekeepers to consider when we do what we do; we have to treat for varroa and nosema based on Mother Nature’s fluctuations. This article is just a glimpse of the wealth of beekeeping knowledge that can be gained from the informal networking and expert presentations at the annual meeting. We must be lifelong learners in our beekeeping to keep ahead of all the challenges our bees face. Make it a point to enroll in an intermediate bee school this winter and mark your calendar to attend the next annual meeting in October 2011. Your bees will thank you! found across the state’s apiaries. Top honors from the contest went to Andrew Dewey’s bees in Southwest H arbor.